Omnia.11 is available in FM+HD with separate processing paths for FM and HD/DRM and FM without HD/DRM. The FM-only model is upgradeable to FM/HD at a later date. Switchable Single Sideband Suppressed Carrier (SSBSC) technology for potential reduction of multipath is standard feature. A front panel touch screen GUI, on a 10.5" diagonal screen, provides ease of use and enhanced metering and diagnostics. Remote access is available via any web browser. Livewire, AES/EBU digital and analog I/O are standard. Fanless cooling. Rugged 4 RU chassis. Both FM+HD and FM-only models are also available with the Perfect Declipper Option, a revolutionary new algorithm that restores clipped areas in audio recordings engineered by audio-processing legend Hans van Zutphen. This algorithm not only restores dynamics, but removes distortion. • Optional G-Force™ Dynamics Engine Plug-In: Enables Omnia.11 to handle rapidly changing, hyper-compressed source material better than ever with new, sophisticated improvements. A brand-new dynamics processing framework enables the Omnia.11 to set the overall EQ for signature consistency, making it sound cleaner, clearer, louder, more consistent, more open, and more pleasing. You hear the music. You hear the voice. You don’t hear the processor. You must be running Omnia.11 v3.0 to install the G-Force Engine Plug-In. • Solar Plexus: For deep, tight bass that you can feel! • 1 Louder: To gain that extra db of loudness. • Intelligent Ultra-Multiband Limiter System: Self-adjusting attack/release functions guarantee crystal clear music and voice. The limiters are self-adapting and can tune themselves to the activity of the AGC section on the fly, providing more powerful and transparent limiter action than possible before. Makes adjustment of limiters a breeze! • Bass Management: Manages harmonics for a natural and undistorted bottom end. • Ultra LoIMD Distortion Controlled Clipper System: Dramatically reduces intermodulation distortion (IMD) for more loudness headroom. • SSBSC Technology: Omnia.11 Single Sideband Suppressed Carrier (SSBSC) technology may reduce multipath distortion. • Extra Wide Touchscreen: 10.5" diagonal screen clearly shows all controls. • Looks Cool and Stays Cool: Military-grade, fanless industrial design stays cool with heatsinks in rugged chassis. G-Force runs on new Omnia.11 Version 3.0 system software. Included in this general system release are many improvements, including: RDS; the flexibility of analog, AES/EBU or Livewire patch points; patch point location for PPM chains so you can integrate your Voltair/Encoder combo into your audio processing chain; patch point input and output meters for easy level references; upper subharmonic control of Solar Plexus over tonal balance; and compatibility with the Day-Sequerra Time Lock system. A parametric EQ including lo and hi shelf replaces the limiter mixer section in the HD processing chain, adding compatibility with the new patch point location for more flexibility. You can select whether the HD processing is fed with the signal that goes through the patch point or not, allowing for separate PPM watermarking of HD/digital sides. Finally, all input and output “Master” level controls now adjust in 0.1dB steps, with an “accelerator” mode giving 0.5dB steps. G-Force's highly refined density detection scheme means rock-solid performance across a wide range of recordings. Program adaptive attack, release, and ratio values let you set the characteristic elements of your signature sound and make audio acceleration and deceleration smoother than ever. A Makeup Threshold allows for gain management and control without sudden, audible swings. Additionally, AGC sections synchronize with program material. Multiband Limiters now self-adapt to the Multiband AGC activity and also feature program-controlled attack and release, actively reducing limiter-induced inter-mod distortion. Limiters are more responsive and active, yet remarkably transparent, even under extreme activity. G-Force requires v3.0. outlined below. Just when you thought nothing could sound any better, G-Force-enabled Omnia.11s can be upgraded with the Perfect Declipper license. Engineered by audio-processing legend Hans van Zutphen, the Perfect Declipper uses a revolutionary new algorithm to replace clipped areas in audio recordings, restoring dynamics and removing distortion. You must be running v3.0 with G-Force to install the Perfect Declipper. Traditional limiting technology has often resulted in various forms of audio corruption. Omnia.11’s new LoIMD technology coupled with smart gain reduction algorithms now have limiters that sound amazingly transparent. All AGC and limiting algorithms employ an auto acceleration / deceleration mechanism, which tunes out perceptible intermodulation distortion. The attack/release functions adjust themselves based upon content density. This breakthrough method literally analyzes the audio content in both the amplitude and frequency domain, then adapts the timing networks—on the fly—to transparently control the signal, without the control being heard. The result is revealed in added detail, clarity, and quality, yet maintaining the desired competitive loudness level. Special attention was paid to the behavior of live voice quality. The improved performance of the AGC and limiter functions generate live voice clarity and impact far beyond that which was previously possible. The bass enhancement algorithm is a key feature of the Omnia.11. Low end is now broadcast with recording studio-like punch and impact, with no traditional side-effects whatsoever. 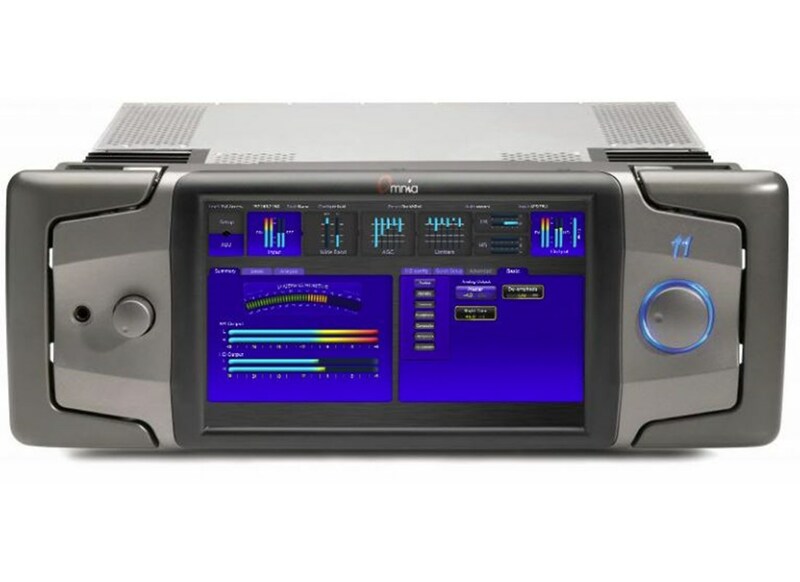 Omnia.11’s exclusive bass-management method is a mixture of innovation, as well as a rearrangement of the system topology. Achieving great-sounding bass requires the most effort, partly due to the fact that the bass spectrum has the most number of harmonics, and all of these must be kept properly accounted for in the time domain. Also, any additional spectra created (enhancement) must have its harmonic content managed, or the bass region begins to sound distorted and unnatural. This process requires much more than just traditional EQ, bass clipping/filtering, or any ordinary attempt at bass enhancement. Even the location where the function is inserted matters, as well as how it maintains its frequency range along with the rest of the system. An entire dissertation could be done on the bass enhancement/management system alone. The classic Omnia dynamically flat & time aligned crossover system has been further refined to produce smooth, rich, and full tonality. The AGC and limiter sections cannot be fooled into false gain control due to spectral density (or lack thereof) from the crossover network. G-Force takes this all to another level of greatness that allows broadcasters to adjust the Omnia.11's bass via a single knob. Advanced adjustment mode allows more precise bass sculpting, including Omnia's Solar Plexus bass enhancement feature. An intelligent active bass clipper system allows the full power of the new bass enhancement scheme to come through on the dial. • Ultra LoIMD Distortion Controlled Clipper System: Audio processing for conventional broadcast (FM and AM) has, in some applications, reached extreme levels. Various methods are available today capable of creating LOUD competitive signals, but at the expense of perceptible quality. Through critical listening, extensive research, and evaluation of processing methods, it has been determined the single most annoying quotient is due to intermodulation distortion (IMD) induced by aggressive functions within the processing system. The algorithms are pushed to the limits, and beyond. One of the most crucial, aggressively used algorithms in the FM processor is the pre-emphasized final limiter/clipper. Omnia Engineering has developed the new Ultra LoIMD Distortion controlled clipper system specifically to reduce IMD in this critical stage of the processing. For those who feel the need to use it, there’s also a composite clipper embedded in the stereo generator. However, to date, all of our testing has been done without any composite clipping. Pilot protection is on the order of magnitude close to 90 dB, which is considerably more protection than necessary for even the best FM receiver. Integrated laboratory-grade stereo generator with dual MPX outputs, 19 kHz reference output for external RDS/RBDS systems and pilot protection that provides >80dB pilot protection—with or without composite clipping. MPX spectral low-pass filter protects RDS/RBDS and SCA signals if composite clipping is employed. There are multiple ways to adjust the system to achieve the exact sound you’re looking for. • A front panel touch screen GUI, on a 10.5" diagonal screen, provides ease of use and enhanced metering and diagnostics. Remote access is via any web browser. • Livewire, AES/EBU digital and analog I/O is standard. Headphone soft “patch points” are available for listening through the processing chain.